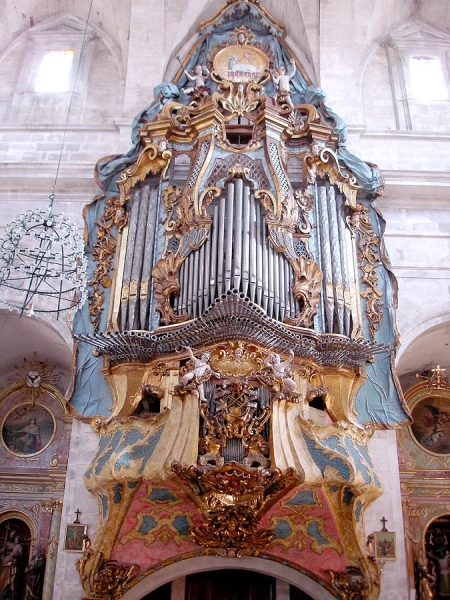 Description: The two manual organ with 40 divided ranks of Jordi Bosch is a real gem among the Mallorcan organs. Its monumental and splendidly decorated facade (by Fra Albert Borguny) resembles the imperial pomposity of the time and adds to the brilliant sound of its stops. Jordi Bosch (1739-1801) was a renowned Mallorquin organ builder who lived in 18th century. His work gradually gains the recognition it deserves in the European organ building tradition. Among his works we find also the celebrated organ of the Cathedral of Seville (1792) or the organ in the royal palace in Madrid (1778) where we find many technical innovations like double windchest, call-ups (later called "appels"), bellows with pressure compensation and other. Bosch abandoned the pure Mallorcan organ building style in order to develop an innovatory style and new techniques, getting so some two generation ahead of the central European evolution. Some researchers point out Bosch's influences on young Aristide Cavaillé-Coll who might have studied Bosch's organ in the royal palace in Madrid. The Santanyi organ was one of his first works. He built it at the age of 26 for the monastery of Santo Domingo in Palma. After the Dominican monastery was abolished in 1837 the organ was translated to Santanyi. Because the church was smaller than the St. Domingo the organ was reassembled by Guillem Puig only partially. Later visitors of Santanyi claim that "the pipes and trumpets were lying in corridors and elsewhere". Only in 1873 the Cadireta was reinstalled. In the 1888 the great Corneta was installed. But the organ was still only partially functioning since in 1932 an article appeared in a local newspaper describing the deplorable state of the instrument. The visiting organist reports that not all the stops were present and that there were old labels on the stop jambs reminding of past drawstops which were no longer there, only holes remained. From his report we also know that most probably the organ had originally three manuals. Unfortunately, his report is a bit confused at this point and no further specifications are given. In 1957 the organ underwent further alterations (pneumatic action introduced and some new stops). The organ was carefully restored by Gerhard Grenzig in 1984-6. His report about J. Bosch is available on-line.